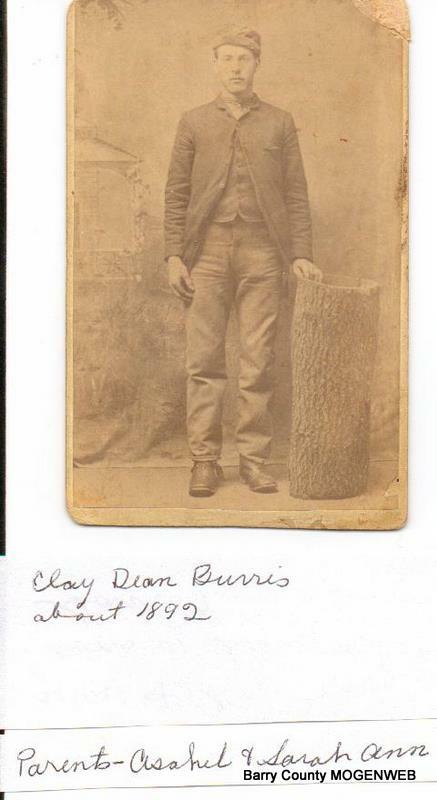 1- William Henry Burris (1856 – 1931)* Check out these Granny’s Front Porch links for more information on his Birth, Marriage, Children, and Death. Married Mary E. Cole b: Oct 30, 1856 in Barry Co., Missouri d: 1898 in Twin Falls, ID. Married April 11, 1880. Daughter of Absolum Thomas Cole b. March 2, 1827 in Limestone, Alabama d. April 24, 1862 in St Louis, Missouri and his wife Eliza Jane (Hicks) Cole Peters b. August 13, 1824 in Knox, Tennessee d. February 11, 1903 in Mano, Cassville, Missouri. His second marriage was to Paralee Powell. Marriage #1 on 1 Jan. 1880, Eagle Rock, Barry Co., Missouri to John Sigel Cole (1 April 1862-23 Aug. 1923), buried Home of Peace Cemetery, Porterville), divorced 17 Oct. 1892, Cassville, Barry Co., Mo. Marriage #2 to Isaac Newton Garrett (22 Oct. 1853, Grovespring, Wright Co., Mo. – 7 Mar. 1920, Eagle Rock) on 15 Feb. 1896, Eagle Rock. …born July 1869, Missouri, died unknown in Orange, near Webb City, Jasper Co., Missouri. Appears to have not married. Single in 1900 census. Married Abraham Hall (12 Sept. 1867 Barry Co., Mo. – 6 Dec. 1937, Monett, Barry Co., Mo.) on 7 April 1892, Barry Co. (Note: Mary Catherine’s death (as told by relatives): Catherine had the measles when her ninth child Geneva was born. Her second son Jesse, 19, was working in the mines in Oronogo, Missouri at the time he received a telegram stating his mother was not expected to live. He and a friend started walking to Joplin (possibly some 7 to 10 miles), where Jesse expected to take a train to Neosho where his family was living. On the way, Jesse and his friend started across a streetcar trestle over a deep ravine. Before they had cleared it, they heard, or saw, a streetcar coming. They clambered off the track and down onto the trestle to wait for the streetcar to pass, but, somehow Jesse fell and was killed on the rocks below. Catherine and the baby both died before news of Jesse’s death was received – there were three deaths in the family in one week (Catherine, baby & Jesse). Married Sara Pearlee Towler (11 Oct. 1892 – died unknown) on 24 Aug. 1907. The 1910 census of Roaring River, Barry Co., Missouri shows Albert Burris 31, Paralee 17, born Missouri, Mabel 1 2/12. Family left Missouri circa 1912-1913 and lived near Oswego and Parson, Kansas until World War I in 1917. Then moved to Augusta, Butler County, Kansas.